Interim USEF CEO Bill Moroney led a Town Hall meeting on accountability for drugs and medications violations. Photo by Lisa Slade. Flipping to the back of Equestrian magazine to see who’d been set down used to be a guilty pleasure most U.S. Equestrian Federation members indulged in first thing when their copy of the official publication hit their mailbox. Digital access to this information via the USEF website only made it easier to discover who might have been complementing their training with a dose of mother’s little helper. But the process of how the federation went about determining guilt remained largely shrouded in mystery until a sample taken from top show hunter Inclusive came up positive for GABA. A legal battle ensued after the Hearing Committee transcripts were made public, and social media exploded. Horsemen expressed concern over widespread use of prohibited substances, but in the next breath they wondered if innocent horsemen were being swept up in an unfair hearing process. The Town Hall kicked off with a presentation of what the USEF has done so far to address concerns. A rule change to GR404, effective Dec. 1, 2015, headed up the list. Now trainers are not the only ones accountable for drug and medication violations. Other “persons responsible” may also be penalized including the owner, athlete, and support personnel such as grooms, handlers, longers and veterinarians. Next the USEF published penalty guidelines for the Hearing Committee. These guidelines outline four categories of offense and suggest what the penalties might be based on the type of substance found and the number of times the individual responsible has offended previously. The USEF published a Hearing Committee pamphlet that outlines enforcement and administrative hearing process. It includes a flow chart of what happens after a positive test is reported and provides answers to frequently asked questions about the process. The federation also asked for membership feedback via Town Hall meetings and a cleansport@usef.org email address. One often-voiced sentiment is that horses should be suspended in addition to the people responsible for their care. Moroney asked the Hearing Committee to discuss how they’d implement that suspension and what the unintended consequences might be. When members wanted to know why it took so long for violations to surface, Moroney explained that the federation grants requests for delays in order to get more prepared before the hearing and generally doesn’t announce the penalty until after they know if a defendant is going to appeal. Moroney also said people had asked that attorney fees be reimbursed for prevailing parties and that a non-adversarial hearing process be guaranteed. In the last part of the Town Hall meeting, members were encouraged to speak, and longtime hunter/jumper trainer Ernest Oare jumped up to voice a suggestion he’s heard ringside for years. He pointed out that it would just be at the national level, but that allowing everyone something like a small dose of acepromazine might actually level the playing field and protect horses from worse abuses. He pointed out that the sport of reining used to allow more substances, and that as that sport went international, they had to change. Others in the room chimed in to defend clean sport. “I can’t imagine promoting my 9-year-old daughter to get involved in a sport where drugs would have to be used in order for my child to compete,” said prominent warmblood breeder Summer Stoffel. The conversation transitioned into a bigger discussion of horsemanship today. Medications replace training for fast results, and robot-like performances are rewarded in the ring. 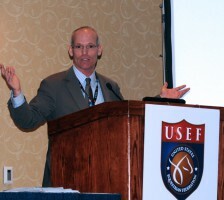 Make sure to check back at www.coth.com for a full recap of the USEF Annual Meeting on Monday morning, Jan. 18.